Here is a card I did for a swap last month with a Christmas theme. It may just be my Christmas card. And yes, I have gone insane to consider coloring ALL those cards-our list tops 100! I'm afraid to get the list out and take a look just yet! Every year seems like we add a few but can't take very many off! Aside from the coloring this didn't take too long. I cut the Naturals Ivory cardstock with the Top Note Die. 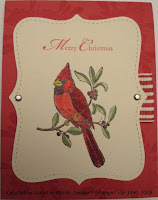 Next I stamped the Cardinal in Jet Black Stazon near the bottom & the Merry Christmas above it. The card base is Riding Hood Red. The Cardinal is colored with Riding Hood Red using the classic ink and a blender pen. I went over him lightly once, then a second time on the head/back/tail areas to make it darker. The leaves are Mellow Moss done the same way, lighter once then darker on one side. Branch is Close to Cocoa, feet & beak are More Mustard. I added a piece of the 1-1/4 Riding Hood Red/Very Vanilla Grosgrain ribbon (from the Holiday Mini Catalog) underneath the Top Note and & Vintage Brad on each side point. Oh, it's hard to see but I stamped the solid branch from the set on the Riding Hood Red in Riding Hood Red on each of the four corners. Sorry my scanner is still toast & the camera doesn't pick it up well. Enjoy! Hopefully I'll be back soon, but no promises. This time of year is always so busy! I started the new job last Friday and it went well. Lots to learn. The days at home go sooooo fast though-I have yet to get very much accomplished! Thanks for stopping by! Gorgeous card! Love how you colored the cardinal! SO glad to hear that your new job is going well! It's always a bit scary to make big switches like that! Hopefully it will work out for the best! Love your card, isn't that Sizzix die just the BEST??!! I love it! Your cardinal is beautiful, that WOULD make a nice Xmas card!!! Oh, and I'm still waiting on my birthday card! :D You know how much I love getting cards in the mail!! !